When you first log into DMS Web you are taken to your Home page. The content provides our personal information, reflects data related to your status with UNA, and displays if available, information from your employer. To Edit, click on the Pencil. Select the Number Type from the drop down menu. 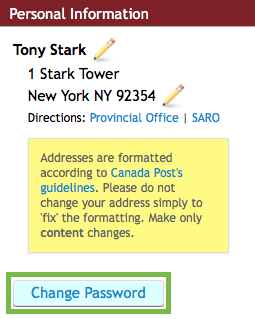 To save the changes click on Check mark or X to revert to the original data. 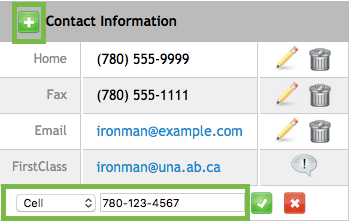 To add a Cell phone number, click the Plus button. Switch the type drop down menu entry from Home to Cell, enter the appropriate number. The system will format the number. Accept the updated information using the Check mark. The Pencil/Delete option now show. To reject the entry, click on the X. To remove an entry, click the Trash Can. The system will verify that you want to delete. Click to Delete to remove and Cancel to go back. To help you calculate the distance between your home and Provincial Office or SARO, click the link provided. Google Maps will appear with the information you require. Google Maps will use your home address and the appropriate UNA office address if possible. This step is also presented on an expense claim. To maintain the security of your account it is suggested that you change your password from time to time. This can now be done using the Change Password button. 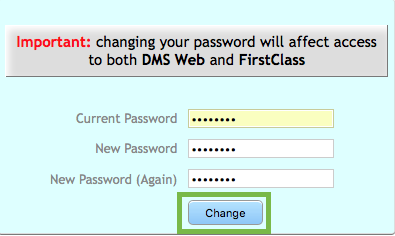 Enter your current password, enter in a new password and re-enter the new password to confirm. The next time you long in to UNANet, you will be required to use the new password. 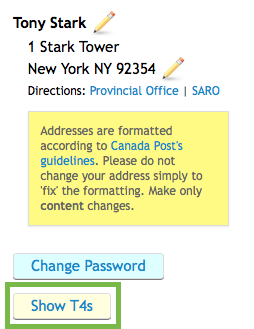 Enter in New Password twice then click on Change. This option allows you to see any T4 information that has been provided by the Finance Department. Note that a T4 is issued if you have had any type of salary replacement or other remuneration. The data visible is what UNA has on record. In addition, your local is identified with the Collective Agreement name and a work phone number. Not everyone has information displayed in the bottom of the Employee List. Here is an example of what might display.